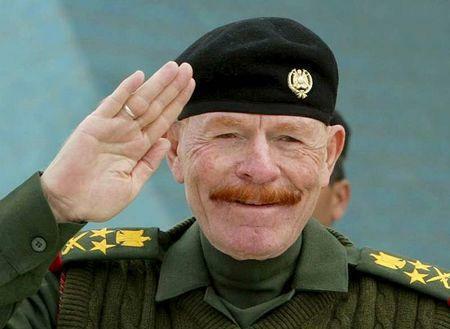 BAGHDAD (Reuters) - An Iraqi Shi'ite militia group said on Sunday it had conducted DNA tests to prove the death of Ezzat al-Douri, former right-hand man to the late president Saddam Hussein, who after the 2003 U.S. invasion was ranked by Washington as the sixth most-wanted Iraqi. "The final results prove that the body belongs to the criminal Ezzat al-Douri," the group's spokesman Jaafar Husseini told Reuters, saying his DNA had been tested in the Iranian-backed Kataib Hizbollah's own special hospitals. He did not reveal details of where those hospitals were located. After the U.S.-led invasion, Douri was ranked 'King of Clubs' in the U.S. military's deck of playing cards representing the most wanted members of Saddam's administration, with a $10 million reward offered for his capture. He was the highest-ranking Saddam loyalist still at large. Kataib Hizbollah is one of a number of Shi'ite paramilitary groups that have risen to prominence fighting Islamic State militants who overran around one third of Iraq last summer after the army's northern divisions disintegrated.